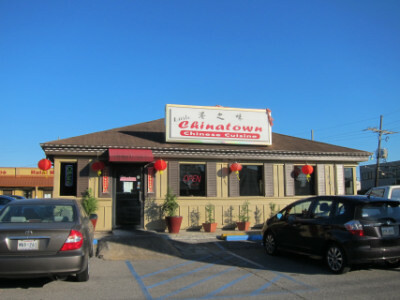 In researching New Orleans restaurants I got the idea from some people that it is rather silly to eat Chinese food here since it is best to experience the city’s own cuisine (Creole, Cajun, etc.). One the other hand I saw some really good reviews of Bao & Noodle for their Chinese food, and I thought if it is really that good I should give it a try. Bao & Noodle turned out to be as good as the reviews indicated, and it gives support to another saying that it is really hard to find a bad meal in New Orleans. I thought Bao & Noodle was the best restaurant I experienced on this particular short visit, but I also have a particular passion for Chinese food that would make me like it better than other cuisines when prepared as well as this one was. 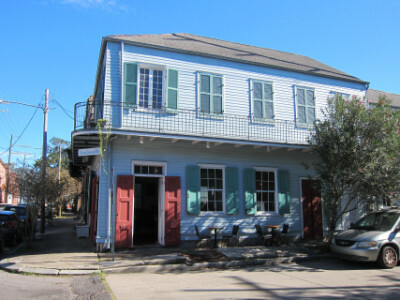 The building itself was a typical New Orleans experience, with open windows and doors giving somewhat of an outdoor patio experience even though the tables were inside (of course the weather was appropriate for doing this, which might not have been the case in the middle of the summer). Although I did not see a lot of Chinese people in New Orleans, they were a large part of the clientele at this restaurant (indicating that they approve of the food served as I did). Bao (steamed dumpling) and noodle dishes are the specialty of the restaurant, with a variety of noodle soups and dishes being served. Since my trip took me through Dallas I tried some bao there, and thought sticking to the noodles might be best for this restaurant. 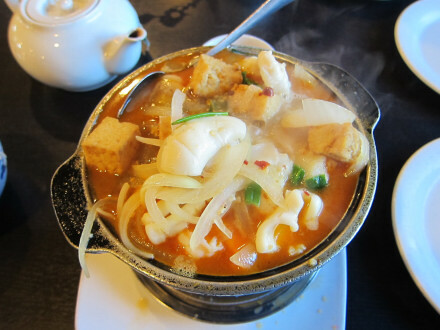 I believe the food here is mostly Sichuan style with some northern style Chinese food and other dishes. 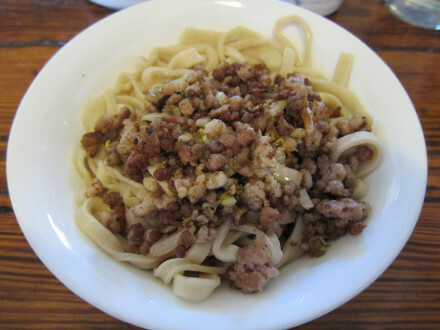 I am not totally familiar with different Chinese cuisines, but I could tell that the noodles and vegetables served were more typical of northern China than in the south such as the Hong Kong area. The spice level seemed closer to real Chinese levels than American style, and I was really impressed that it reached the level where I felt that it brought out the best in these dishes without being so spicy that I had a hard time eating it. 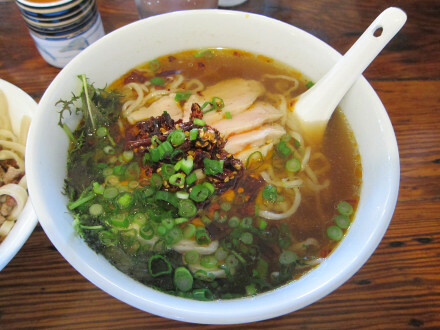 From the photo the Spicy Chicken Soup looks as if it is made up mainly of meat, noodles, chile, and green onions. The broth, though, gives this dish such a flavor enhancement that I count it as one of the best Chinese soups I have eaten (although to be technically correct I only ate a sample of it). High quality ingredients were another key component, and I could see how something like this would be embraced in such a food conscious city. This photo of the Dan Dan Noodles does not show the sauce at the bottom of the bowl, which made this not only better than it initially looked but also one that was very spicy. I would call the sauce a “chile sauce” except that it is not quite as spicy as the type of chile sauce many restaurants serve on the table in a little jars. The components of this dish made it probably the most interesting and best example of dan dan noodles I have tried. Like the soup the flavor is not solely from the ingredients that are the most obvious on top, but they come together when the proper mixing or stirring has been done. The spiciness was not over the top but it was enough so that I felt this dish was quite authentic. The tea was a little expensive, but was made with loose leaves and was quite good. 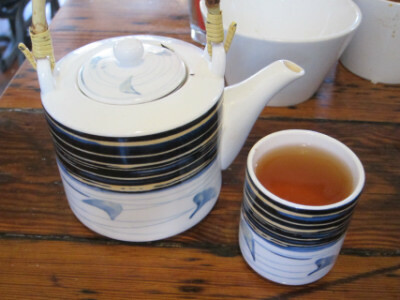 I had a glass of water on hand as well, but the spice level of the food was enough under control that I could enjoy the hot tea with it as well. Both dishes were excellent, but what I really liked about the dan dan noodles is that it was probably the best one I have ever tasted (and therefore is higher on my satisfaction scale for having tried this restaurant). The menu is small and there are not a lot of choices, but it seems that all of them are quite good. The restaurant is small and it seemed that there was one cook and one waiter when I went. To me this shows that they are not making Chinese food for the masses, but they do produce very high quality food for the few people who come to this somewhat out of the way location and can wait for their food (my wait was not bad but I do not know how it would be when they have more of a crowd). If you do not like spicy food at all I suppose they can make it this way for you, but I think the chile is an essential flavor component of this type of food. To compare it to Mexican food, this restaurant is no spicier than the typical restaurant in New Mexico, although it has a higher spice level than would be found with most Tex-Mex food. I did not try the steamed buns but this is a large part of the menu, and seemed to be a very popular item by observing what the other tables had ordered. Cafe Beignet on Decatur St.
My journey here started with a desire to go to Cafe du Monde, but finding that the lines to get in were almost impossible (or at least would significantly decrease my time for seeing other French Quarter sights). I think going to Cafe Beignet was an excellent decision. For one thing Cafe Beignet itself got to full capacity right after I ordered, and more importantly I accomplished my mission of finding excellent beignets (the specialty of both restaurants). 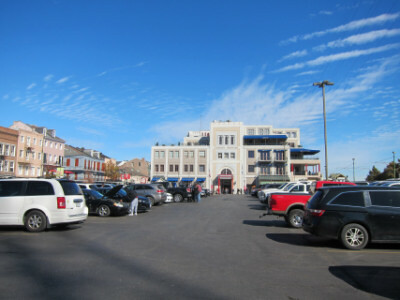 Cafe Beignet is located in the old Jackson Brewery Building (home of Jax Beer) next to a parking lot labeled “Premium Parking” on Google Maps. 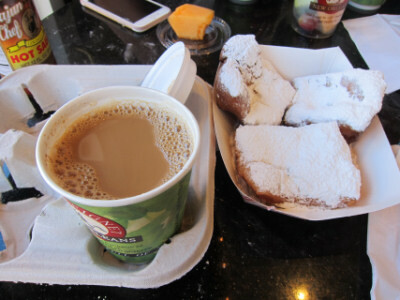 The hourly rate charged at the lot was another reason I wanted to minimize the time waiting for my beignets, but as I found out there was probably no reason to pay for what I think would have been an extra hour in order to try Cafe du Monde. In truth I do not know how any beignets could be better than the ones I had at Cafe Beignet. This was truly one of the best sweet treat experiences I have ever had (although many in New Orleans call it breakfast). It is possible that the beignets at Cafe du Monde are better, but I did observe that they were smaller (even though I wasn’t able to order anything there I walked in and saw what they were serving). 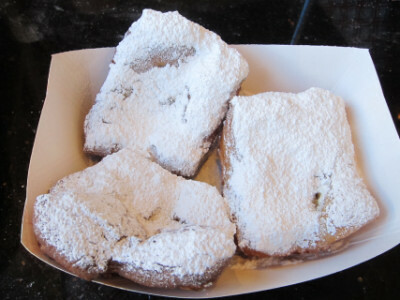 Beignets are deep fried dough covered with powdered sugar. This description does not make it sound like something special, but the ones I tried here definitely were a special treat. It is not something I want to repeat at regular intervals knowing what the nutritional content and calorie count must be, but it was certainly something I enjoyed for a special experience. The pastries come in an order of three for $3.99, and I certainly thought this was a bargain. Being a cafe, coffee is the other main attraction here. I am not a coffee drinker, but the lady at the counter talked me into a Caramel au Lait because it was “mostly milk with not much coffee.” Even this did not convince me to become a coffee drinker, but I enjoyed it as a one time experience (especially with these wonderful beignets). I did not order a sandwich, but they are available as evidence by the one shown in the photo. Cafe Beignet has fruit cups and other items that will give you a good breakfast even if beignets are not on the agenda for you. It was interesting, though, that many patrons included drinks from the bar as part of their breakfast menu. Both Cafe Beignet and Cafe du Monde have other locations, but most people seem to flock to the ones on Decatur Street for both restaurants. 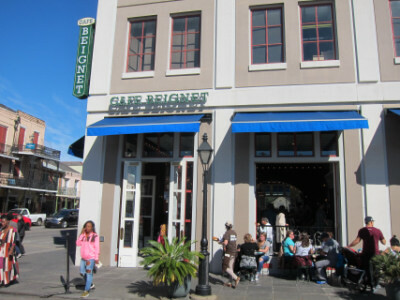 I enjoyed the atmosphere of Cafe Beignet which included an open air setting and patio tables if you want to eat outdoors. 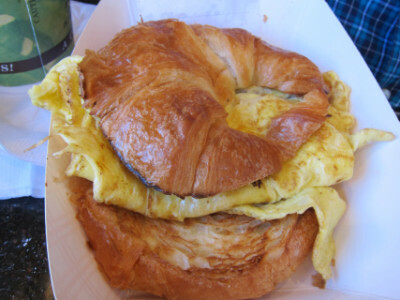 My friend who ordered the croissant had to wait for what seemed to be an inordinate time for it, but otherwise the restaurant lived up to my expectations for a great beignet experience.